Hi all! after getting the hint from one of our inmates (you know who you are) about not writing a ride report on one of my recent escapades I thought I would enlighten you all about how a few of us spent last weekend. 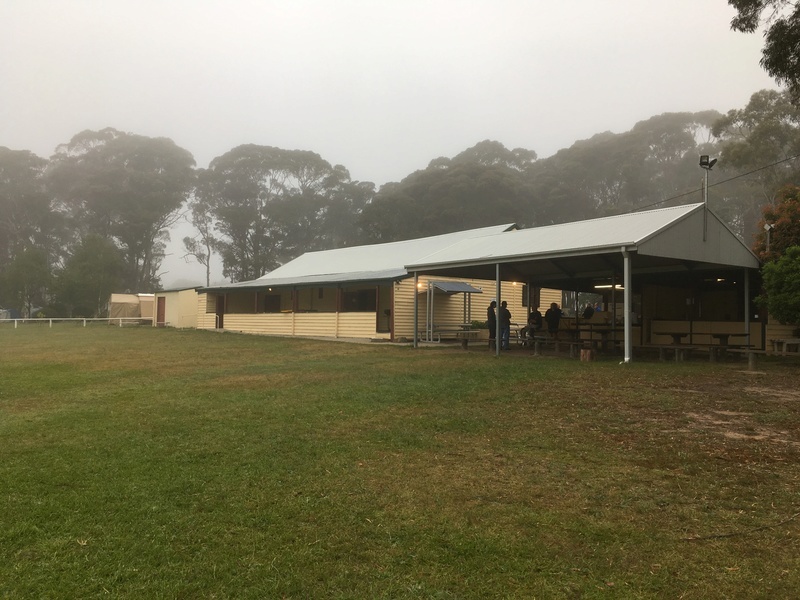 Some of us are members of the BMW New South Wales Touring Club and the club held it's annual Christmas Party last weekend at a little town place called Majors Creek in the southern ranges south east of Canberra. 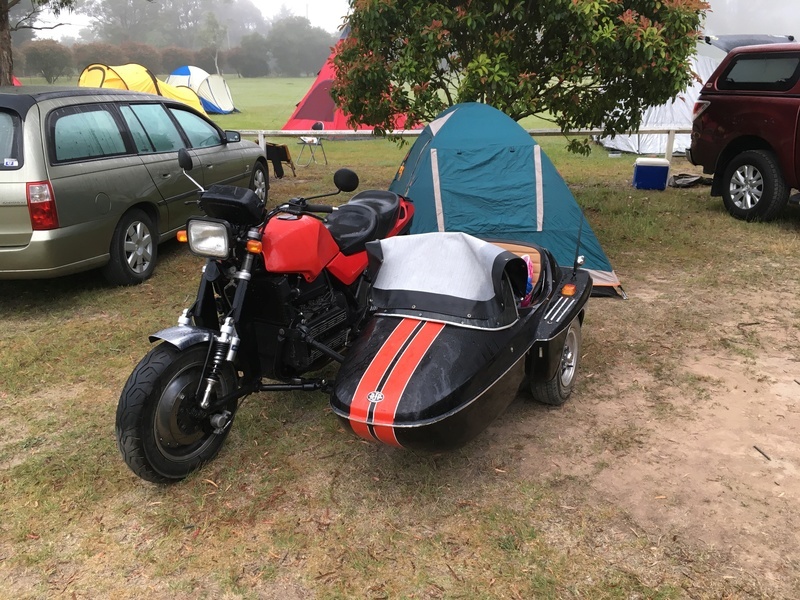 Tom had finally battled the blue K75 into submission and was keen to give it a run and I was also keen to get a good run under my belt as I hadn't been on a trip away for three weeks. 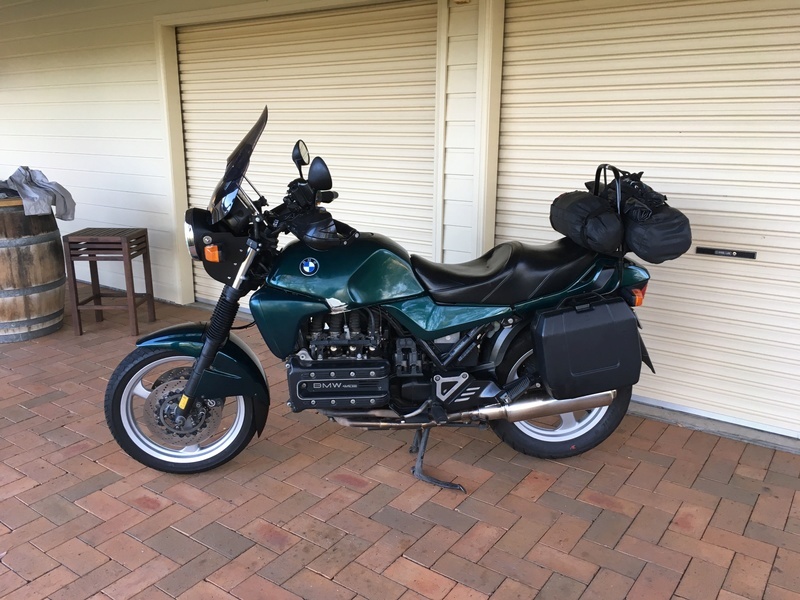 My K1100 packed ready to go. So Tom got up early and met me at Greta at 7:00am on Saturday morning which had dawned mild and clear - just perfect for riding. Ready to launch from our meeting place. 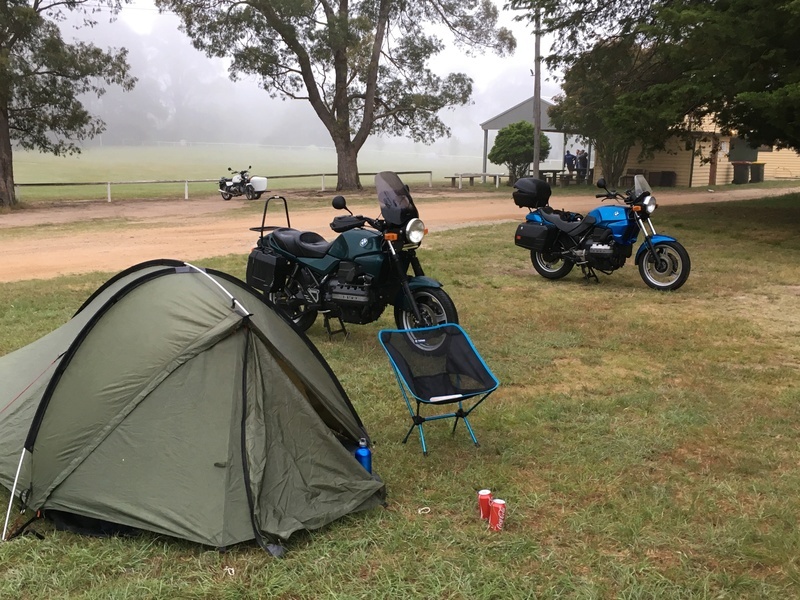 We rode down to Rylstone through the beautiful Bylong Valley, which we never get tired of, for our first stop for morning koffee at around the 250km mark from Tom's place. Here's a link to some photos and you'll see why. 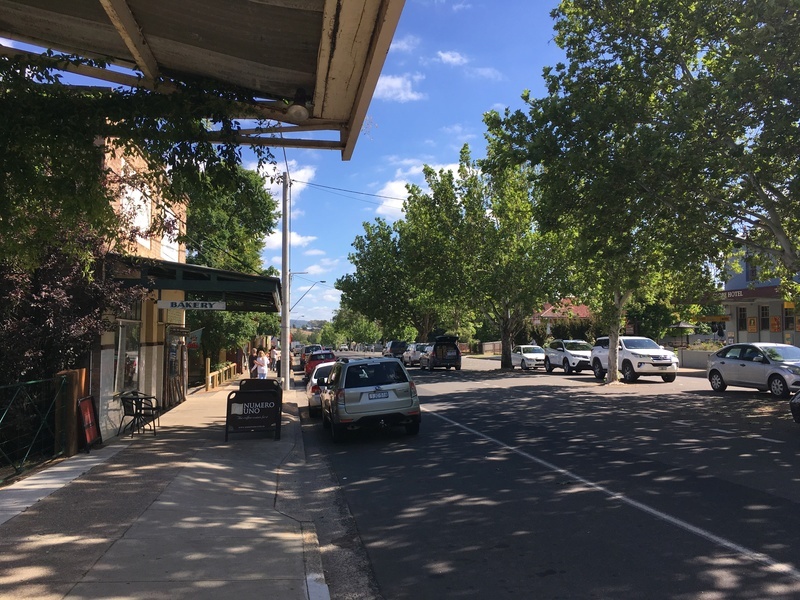 The pleasant streetscape at Rylstone. Fed and fueled we then headed down to Bathurst via Sofala and Wattle Flat. This track takes us into some high country up to about 900 metres at Wattle Flat which kept the temperature nice and mild. Bathurst sits at about 650 metres and then our track climbed back up to 1,100 metres at Oberon where we had a leisurely lunch. The road south down through Taralga continues through the high country getting up to about 1,200 metres then steadily dropping down towards Goulburn at around 700 metres where we had arranged to catch up with Bill. 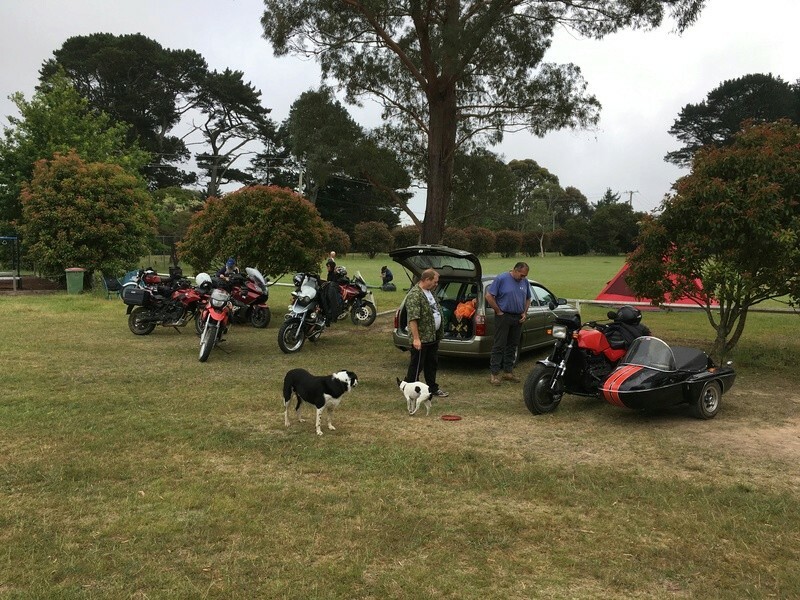 Bill and his wife graciously provided a welkome afternoon tea before Tom and I pushed off on the last leg of the day to Majors Creek via Tarago and Braidwood. 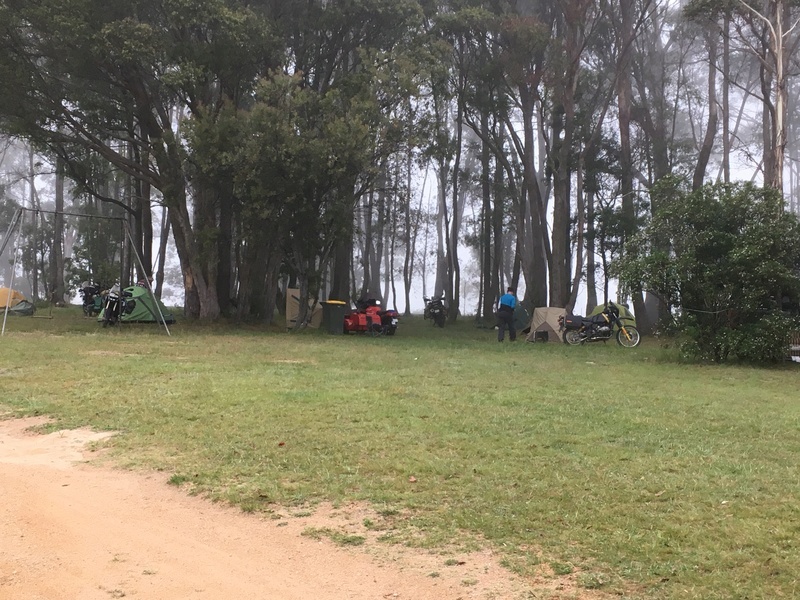 We arrived in the camp site around 6:00pm with about 600 km under the wheels for me and a bit more for Tom, all in all a very pleasant day's touring. Amongst the earlier arrivals was Waz who ventured down on his K100 outfit and Al-58 along with Marie and the dogs. Leroy was doing the rounds looking for willing players to throw his frisbee as usual. Leroy waiting expectantly for a frisbee throw while Al and Waz discuss the meaning of life or why they ride sidecars. The club had arranged catering for our dinner in the hall at the campground where a good night was had by all. You could tell we were still in the high country by the coolness of the evening and the fog blanket starting to descend. Camping was available around or on the oval or nearby in small grove of trees so there was something for everyone. Tom and Waz were up before me cracking into the packing before breakfast, provided by the club, and when I found them Tom was muttering something about tent designers not allowing enough space in the carry bag to get the damn thing back in again. He had contracted Waz to apply force as necessary. 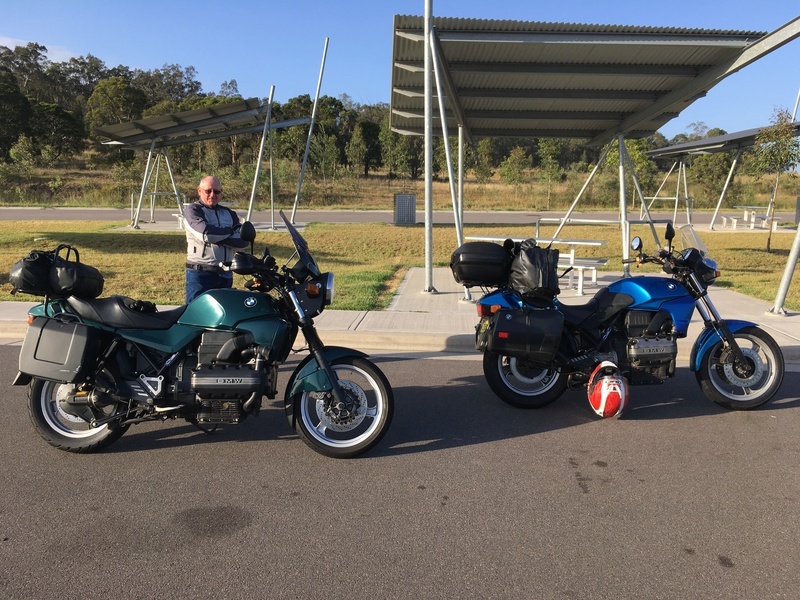 The plan for Sunday was for Tom, Waz and I to head to Nerriga and then down to the coast at Nowra where Tom would peel off to visit an old friend and I would accompany Waz back to his base before heading home. 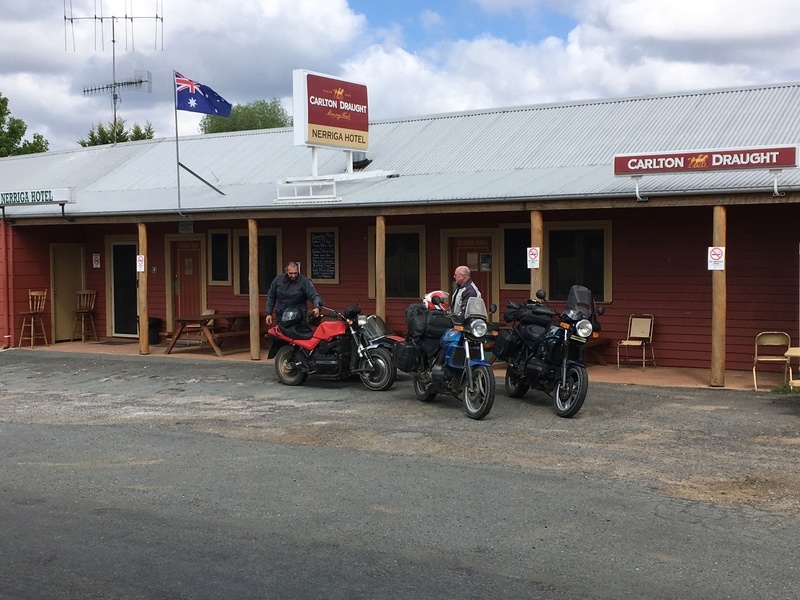 Since the K bikes had been outnumbered by their R cousins at the campsite we thought it appropriate to pull up at the Nerriga Pub for a family shot. After a generous lunch at Waz's place I headed off home with only a stop at the motorway service centre for fuel and stretch the legs. As I was about the climb back aboard I noticed that Tom had pulled in a few minutes behind me so after a short chat we both hit the road home in our separate directions. Thanks for the kompany guys - another good trip - a bit over 1,000kms. Here's a link to the round trip map. Gaz, what great roads and a wonderful way to avoid the Sydney environs. 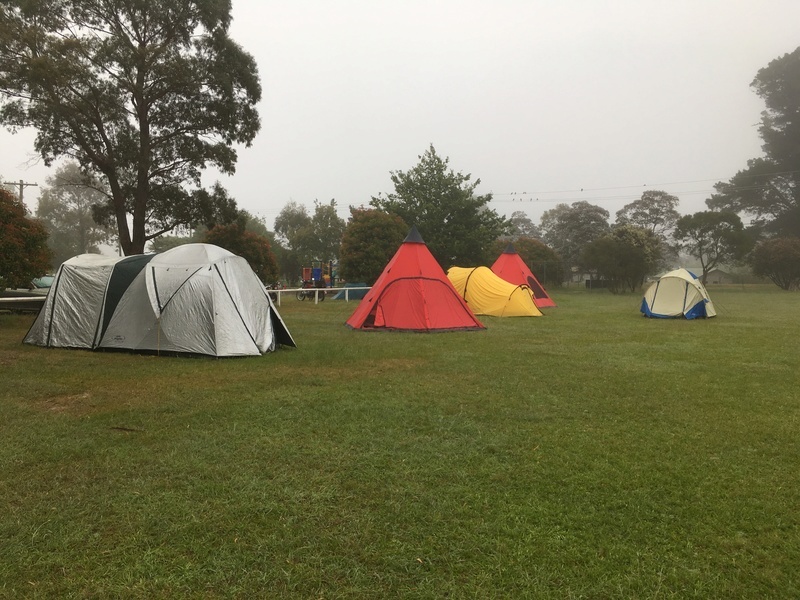 Majors Creek oval looks like a fantastic spot to camp. Tom's K75 is looking very tidy. Gaz, Tom, glad to hear you guys had a great run. 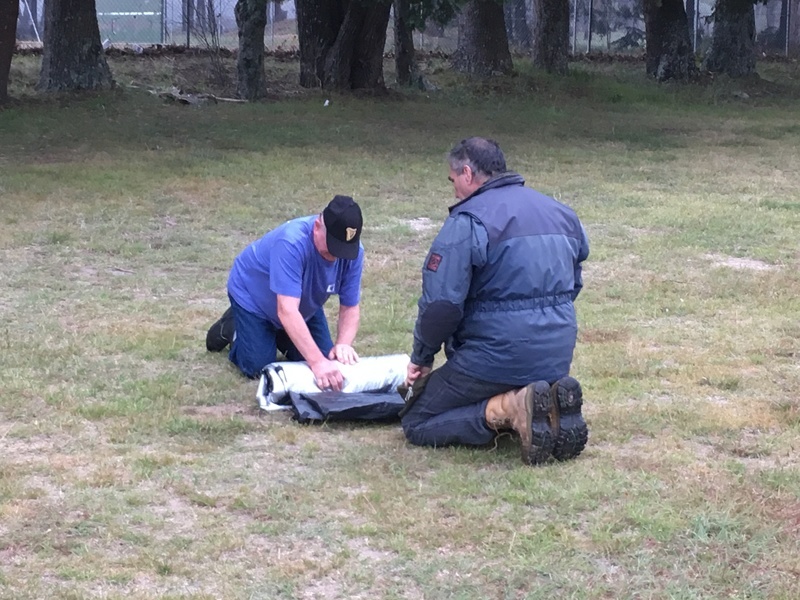 Thanks Gaz - great to see you managed to produce a report this time! I always enjoy reading of your travels and tales of those who drop in and out along the way. A nice route too...you know how much I like maps to put everything in context and bring the trip to life. Your effort is much appreciated - I enjoy seeing those blue sky photos, especially while sitting here shrouded in the grey gloom of winter and still not riding (3 weeks now and getting Kabin fever/Kold turkey). Gaz, great write up and photos of the do. I was a bit nervous taking the 75 after its mechanical issues but it performed flawlessly. The run down to Major's Creek was fantastic as was meeting up with Bill at Goulburn. Bill did not have skones on offer but did well with croissants instead. It was also good to meet up with Waz and his outfit which I have never seen in the flesh. Met some interesting people and overall it was a great weekend.